I think there has always been a mexican restaurant in Disneyland. 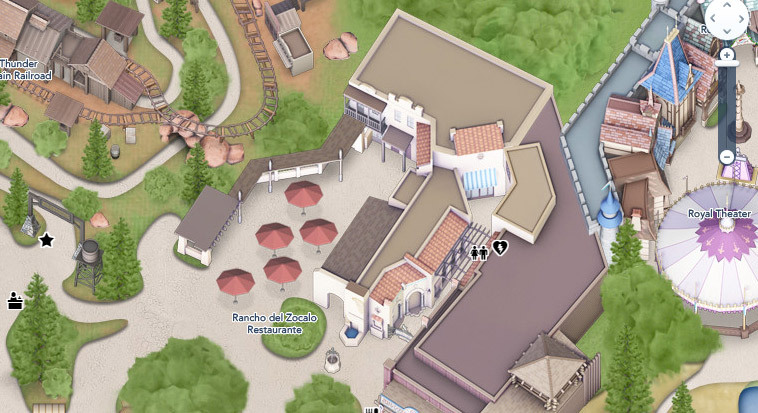 Rancho del Zocalo is in Frontierland. In front of the Zocalo flowers sign. The restaurant is to the right in this photo. This photo can help orient you as to where everything is on the north side of the street in Frontierland. The shooting exhibition is to the right, then the arched pathway to Fantasy Faire, then the adobe archway to Rancho del Zocalo. The adobe walls of Zocalo, circling the restaurant tables. Thunder Mountain's construction crane dominates the horizon. Just before leaving Disneyland for the night, a group shot in front of Ranch del Zocalo. It is against the rules to sit on these crowd control ropes, so don't do it if someone is around.